Come along for great discussions and knowledge sharing on all the hot topics from the conference and all those we could not squeeze into the conference days! Never heard of a barcamp? Have a look here to get an idea. As we all know some of the most interesting conversations happen after the official programme is over. That's why we want to encourage everyone participating in the barcamp to afterwards meet in a bar nearby. If you would like to join the #bbuzz Barcamp on Sunday June 10 at Palais Atelier, you can bring your conference ticket to check-in and save some time to enjoy your lunch. How can you join the barcamp? Get a ticket for Berlin Buzzwords 2018. Barcamps are informal sessions, a kind of "un-conference", with a schedule decided on the day. It is all driven by the interests and expertise of those who attend so each one is different, but ours are always great! Although the barcamp doesn't have a strict schedule, it won't be completely devoid of structure! 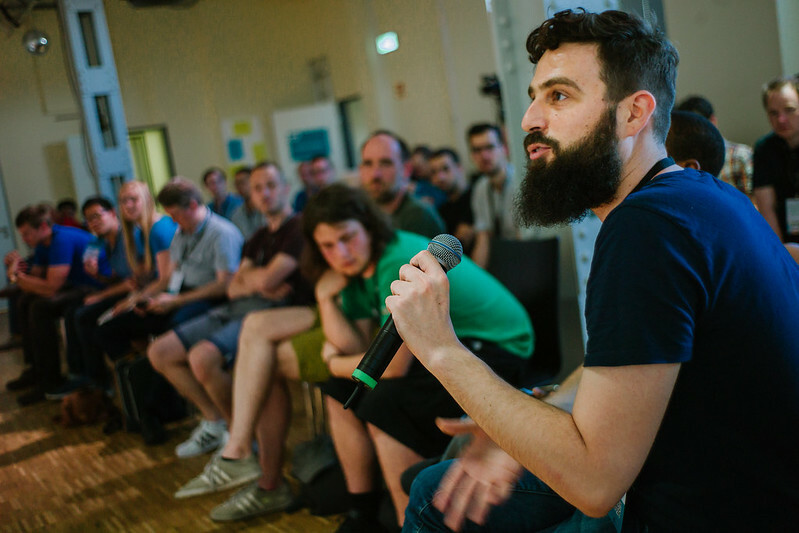 #bbuzz barcamps are dynamic events, focused on the overall Berlin Buzzwords topics, tackling the same challenges but in a different format. At the barcamp each session runs for 30 minutes giving enough time to get into the meat of a topic, but without a chance of anyone getting bored. These are participatory sessions and more inclusive than regular conference talks, with everyone taking part. You can help by leading the session, by giving some insights, by asking some great questions, or maybe just with your enthusiasm. If you want to have a drink and continue your conversations after the barcamp, we invite you to come with us to the Dirty Velvet Drinkery! * Get 1 EUR discount with your Berlin Buzzwords badge on everything from tap (Krombacher, Murphys, Strongbow). On top, we have teamed up with the Gentlemen Rebels of Dirty Velvet Clothing and will raffle 10 t-shirts that night! See the full collection here. *Please be aware that smoking is allowed in this bar.